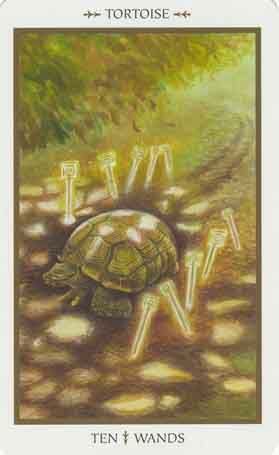 Symbols*: The turtoise struggles to continue with its heavy burden. It slowly crawls between two rows of wands. The wands do not stand erect but align the muddy path with their skewed presence. The spiral tips of the wands are squared and cumbersome. They echo the motif of the heavy tortoise shell that limits the tortoise to slow, steady movements. The tortoise is suffering under the weight of its load but it must seek shelter from the hot sunrays that are poking through the trees. It can no longer absorb external energy and soon it will retreat to its shell for safety and a possible period of dormancy. Description*: You have put too much upon yourself. You are bravely assuming the burden of your load but you know deep down inside that you cannot keep it up. You need to stop, rest, and take stock of your situation. Try to decipher what may be encumbering your being and take action to alleviate undo stress and baggage. Decide what is really worth carrying around with you and what things are better left behind. Possible Meaning: Even if things seem to be too much for you to handle at this moment, take a break. It doesn’t matter how long of a break, but take it. Otherwise, there may be a chance of burning over (I can’t get the right word in my head right now, ugh!). Lose the unnecessary to be able to turn a new chapter of your life. Thoughts/Points to Ponder: This tortoise is old but wise. He is laid back, he doesn’t worry or hurry anywhere. I don’t see him as having heavy burdens on his shoulder but more of a traveler, a wanderer. He reminds me of Eeyore from Winnie the Pooh, only a positive version. The Earth is very strongly present here.